Until the end of September we have the following promotions. Use File Viking to automate your Drag & Drop actions for files. Always copying, moving, zipping or uploading to the same destination? Save some time with File Viking! File Viking is available in English, German, French and Spanish. 64-bit and 32-bit supported. Use the discount-code FVSUMMER12 in our webshop to get the discount. If you already own multiple WatchDirectory and/or WatchFTP licenses WxRemote is a perfect add-on. Remotely start and stop tasks from your webbrowser, mobile phone or from a dedicated Windows Program. WxRemote is available in English, German, French and Spanish. Use the discount-code WXSUMMER12 in our webshop to get the discount. WatchDirectory and WatchFTP customers can get a 15% discount on WatchFTP! Contact Us for a discount-code. WatchDirectory and WatchFTP customers can get a 15% discount on WatchDirectory! Contact Us for a discount-code. Just uploaded a new (and probably last) beta for WatchFTP v3.1. We expect this beta to be released early September. Fixed: In some cases WatchFTP did not remove the empty FTP folder (when the task was configured to remove the empty folder). You can find more info and the download on our forum. A customer asked how he can automatically print PDF files downloaded by WatchFTP. WatchFTP can start a batch file after downloading so we use a script to run Foxit Reader to print the file. One extra feature was needed: he wants to print invoices on one printer and tickets on another. echo [%time%] printing %WF_FILE% to printer %PRINTER% >> "%LOG%"
echo [%time%] printed >> "%LOG%"
echo [%time%] ERROR - FILE WAS NOT PRINTED >> "%LOG%"
New: If WatchFTP can not access a directory on your FTP server, the directory will be blacklisted (skipped) and WatchFTP will continue. 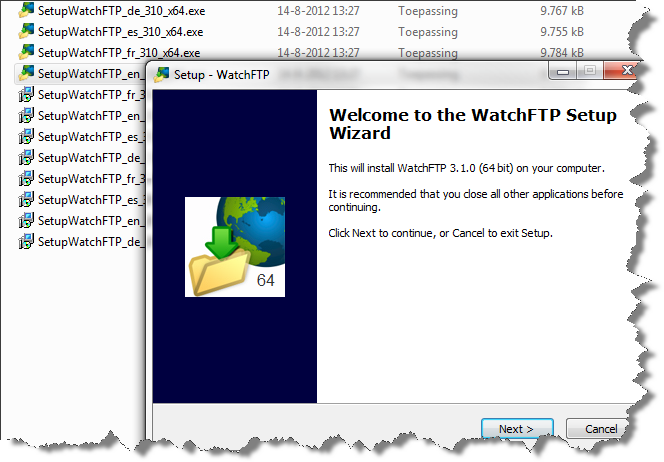 We just released WatchFTP v3.0, a major new version of our FTP download automation tool. New in this release is support for the SFTP protocol. Download it here. This new version is a free upgrade for all customers. Please note that you will need a new license key for this new version. Lookup your License here. If you are using one of the beta versions of WatchFTP v3, you need to take a few steps to get your (updated) tasks into the new release. This is explained here. The German translation is already available at www.watchftp.de. The French and Spanish versions will follow soon. If you appreciate this free upgrade, please consider making a donation to the Alzheimer's Association or your own favorite charity. 64 bit release. v3.1 will be in beta soon and officially released later this year. Free upgrade for customers. We just released a new version of WatchDirectory, see the list of changes below. All customers who have a v4 license key can upgrade for free by installing the current evaluation version "on top" of their current install. Download it from our webpage. Improved: When using the Scheduler, QUIET events were not handled properly. New: The FTP Upload task has a new "Strict" option for Passive connections. This helps when the FTP server lies (!!) about its IP address in response to the PASV command. Improved: Small improvements to the ZIP component preventing it to hang on illegal filenames. New: UTF-8 support for the email component. This is now the new default for message encoding when you create a new email task.